When most people think of deodorants, they imagine waxy sticks available at the drugstore. Few realize that there are other options on the market, which are a boon to us who have allergies to conventional deodorants. One alternative to sticks is Honeybee Gardens' gentle Deodorant Powder. 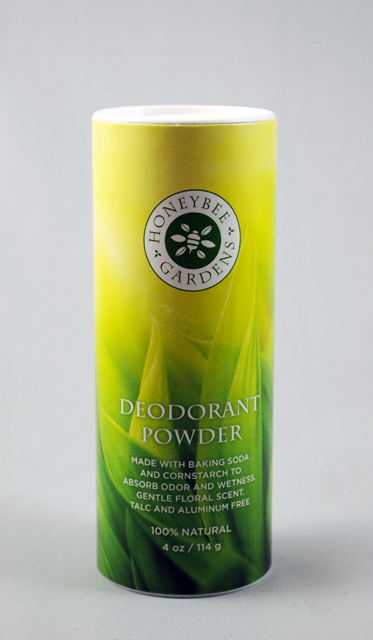 This deodorant powder is made with just a few simple ingredients: baking soda, cornstarch, arrowroot, and essential oils. This version has a more feminine scent, but there is also a mens' version available as well. I love how this rates a low 1 on EWG's Skin Deep scale. It is also affordable, but you may have to order online. The strength may vary depending on your body's chemistry. Don't feel limited to using it on your underarms; I used this as a foot powder when wearing ballet flats in the summer and it kept my feet deodorized. If you're looking for an alternative to stick deodorants, you might want to give this powder a try.